« Books To Go Now has four new releases we’re excited about! 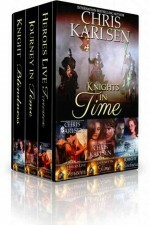 “Knights In Time is a great series! The cover fits the story perfectly. This is a romantic story of a wonderful knight who is given a second chance of life and love. As a ghost he falls in love with Elinor who has inherited his ancestral lands. It is a delightful tale with romance and humor. It was hard to put down. I highly recommend it and I plan to read her next novel. Very good story line – great detail and the characters were interesting. I really can’t wait to read more from this author. Shakira and Alex are well-drawn characters unexpectedly thrust back in time to a date one is very familiar with – and the other is not. A breathtaking, heart-felt romance sprinkled with humor, Journey in Time is a fantastic read full of vivid, historical detail you will not want to miss! I really enjoyed the thought put into this book. There were times that I just could not stop reading. I had to go on and see how a particular incident was going to turn out. The research really was spot on for that time in history. An internationally published author, Chris has traveled extensively throughout Europe, the Near East, and North Africa satisfying her need to visit the places she read about. Having spent a great deal of time in England and Turkey, she has used her love of both places as settings for her books. “Heroes Live Forever,” which is her debut book, is set in England as is the sequel, “Journey in Time.” Both are part of her “Knights in Time,” series. Her third book, to be released in late 2011, “Golden Chariot,” is set in Turkey and she is currently working on another set in Turkey, Paris and Cyprus. Published by Books to Go Now, her novels are available in digital, ebook, and Android App. “Heroes Live Forever,” is available in paperback and “Journey in Time,” will be made available in paperback in October, 2011 on her publisher’s site. 1 comment to International Best-Seller Chris Karlsen Releases her Knights in Time Boxed Set”! Chris – What a great accomplishment to have a series completed. Congratulations.